Yes, you read that correctly. 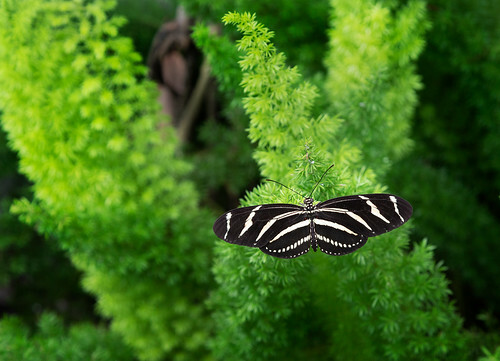 This butterfly, which appears to be entirely black and white, is variously called a Red Spotted Butterfly, a Red Spotted Admiral, and sometimes a White Admiral. How it came by that naval rank is as much a mystery (to me, at any rate) as the designation of its spots. Its Latin title is Limenitis arthemis, which means…well, I have no idea what it means. My Latin is rubbish. I am reliably informed, however, that this species belongs to the “brush-footed butterflies”, although I’m not convinced they actually have feet (not as we think of feet, certainly). But perhaps what they have in place of feet are some sort of brush-shaped appendage. Its feet aren’t visible in this photograph, so we can only engage in wild speculation. For all we know they have feet like a Sasquatch. I’m also told these butterflies tend to perch on hindlegs, are very territorial, and highly aggressive when it comes to mating. These traits are probably more of interest to other Red Spotted Butterflies, but I offer them for what they’re worth. What I can say with a high degree of certainty is this: the little bugger is as attractive a butterfly as you’re likely to see on any given day. Also, if you look at the original photograph (and I encourage you to look at the original) very closely you can actually see, up against its body, a pair of tiny tiny tiny exquisitely tiny red spots.